WELCOME TO THE 2016-2017 FOX CITIES UNITED SOCCER SEASON! Team Managers will be emailing you to introduce themselves prior to the beginning of the season and they will be your main source of information throughout the season. All board members and veteran family members are also always willing to help you. We will connect with you at the potluck this summer in July. If you are new to the club, please order your player’s uniform before July 1 to ensure shipment arriving at your home prior to August games or tournament play. Our club uniforms are a custom design and everything is sublimated into the fabric so they will never have numbers peeling away or piping that falls off. The specialty fabric/uniforms also requires a longer turnaround time so please prepare for this. Sizing - If your player did not try on sample uniforms or gear at tryouts, please use the fitting instructions available in the Admiral Webstore to determine the proper size. Because each uniform is made for the player, they will not take returns. Player numbers have already been assigned and you will start by selecting your player team (based on their age) and then name based on the roster choices. Once you complete this, begin your shopping by placing the items in the "gear bag." Step 2 - Each player requires a uniform package. Purchasing the uniform package saves some money and provides the minimum number of items required. It is recommended to have extra Professional socks ($5.06 per pair) and Performance Ts ($14.30). Your player will wear the Performance T as their practice uniform for Fox Cities United. Your player will have two practices per week and a third optional practice opportunity so keep this in mind when ordering. Step 3 - Online shipping and handling costs will apply so it is encouraged to review all tabs available in the Webstore before completing your order. The player is not required to wear long sleeve (LS) jerseys or warm ups, they are there to purchase if desired. If you decide to purchase only one LS jersey, it is recommended to order the primarily lime green LS design. 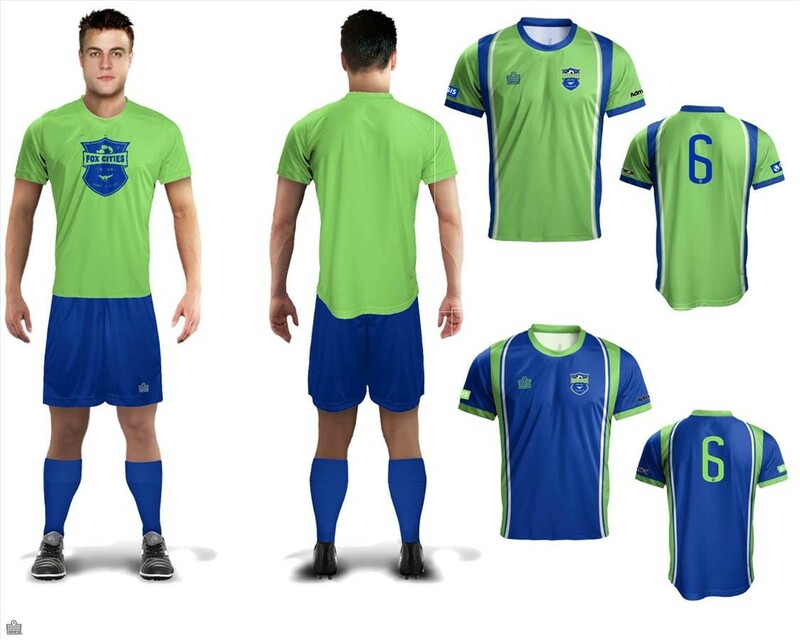 Our club wears the lime set color more than our blue set since many local teams have the royal blue in uniforms. We wear the color that makes sense for the team, it is not strictly determined by "home" or "away" colors so players should always have both uniform sets with them. If you have any questions, please , our volunteer uniform coordinator. Please plan to attend the potluck which will be Monday, July 25 from 6-8 pm at Lion’s Park Pavilion in Greenville. The potluck is an opportunity to get to know your coach, board members, fellow teammates and families. It’s also a forum to learn expectations and ask questions. Spirit wear also will be available to purchase which is a wonderful way to support your team as a family on and off the field. Each family brings a dish to pass; last year it was a taco bar. We will email you closer to the date with a sign-up sheet. FALL PRACTICE SCHEDULE - The complete practice schedule will be available on the website around mid-July. Team Managers will notify you when the schedule is available online. To find your player’s schedule on the website, go to: Teams, Schedule and then choose your child’s age group at the top (ex: U13). There is a download feature that will automatically sync to your Outlook or Gmail calendar. Choose “options” for the calendar feed. MINI-CAMP – The first set of practices are our Mini-Camp which will be the first week in August. These practices will be during the day and will be for one week: Monday through Thursday, August 1-4, 2016. If for some reason you can’t attend Mini Camp, please contact the . Further information will come to you via Team Manager prior to Mini-Camp. FALL GAME SCHEDULE – The league in which we play, East Central, will announce the game schedule early August and at that time, Team Managers will notify you that it is posted to our website. 1 payment: Total installment of $1,100 due August 31, 2016. 2 payments: 1st installment of $600 due August 31, 2016. 2nd installment of $600 due February 28, 2017. 10 payments: 1st installment of $130 due August 2016 with subsequent payments due monthly thereafter. Know someone interested in joining our club? We still have a few spots available on some teams. Have them contact , Director of Coaching for details. New families, we are so glad you joined the Fox Cities United family. We are excited to get to know you and your player. Please contact us with any questions you have along the way!! And to our current players, welcome back!